“Killing the Indian” can take many forms. Indigenous languages are the most varied in the world. When you lose the language, you erase the culture. The Canadian and U.S. practice of removing Native children from their homes and outlawing Native languages has taken a huge toll. Why is there such an attack on Indigenous cultures? Because such cultures relate to the land and resources. What is called “Progress” has another name – genocide. 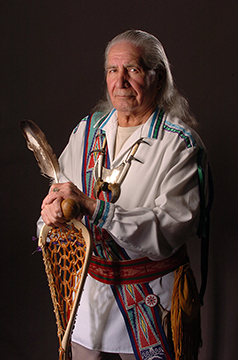 Join us as we welcome Oren R. Lyons Jr., a Native American Faithkeeper of the Turtle Clan of the Seneca Nations of the Iroquois Confederacy, Onondaga Council of Chiefs, to ArtRage to speak on this important issue. Once a college lacrosse player, Lyons is an internationally recognized advocate of indigenous rights. Pictured: Oren Lyons, holding an eagle feather, medicine lacrosse ball and a hand made lacrosse stick made by Alf Jacques at Onondaga Nation.